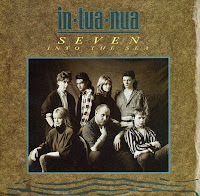 In tua nua (roughly translated from Irish as 'A new tribe' formed in the early Eighties. Originally they set out to make early Roxy Music-style rock, but soon started to fuse this with traditional Irish music, with uillean pipes and acoustic guitars. Some personnel changes resulted in 1986 in the following line-up: Leslie Dowdall, Martin Clancy, Ivan O'Shea, Jack Dublin, Paul Byrne, Aingeala de Burca and Brian O'Briain. This line-up recorded the album 'Vaudeville' and their most famous recording, 'Seven into the sea'. In the Netherlands, this single peaked at number 24.